Join the Recipe Critic for the latest and greatest! Like us on Facebook or follow on Pinterest! When I was younger I hated chocolate. My mom always told me it was probably because when she was pregnant with me, she ate a candy bar everyday on her break! Unfortunately for my waistline, over the years I have started liking it more and more. But if I had to choose between white and milk chocolate…. white chocolate every time! I love white chocolate. 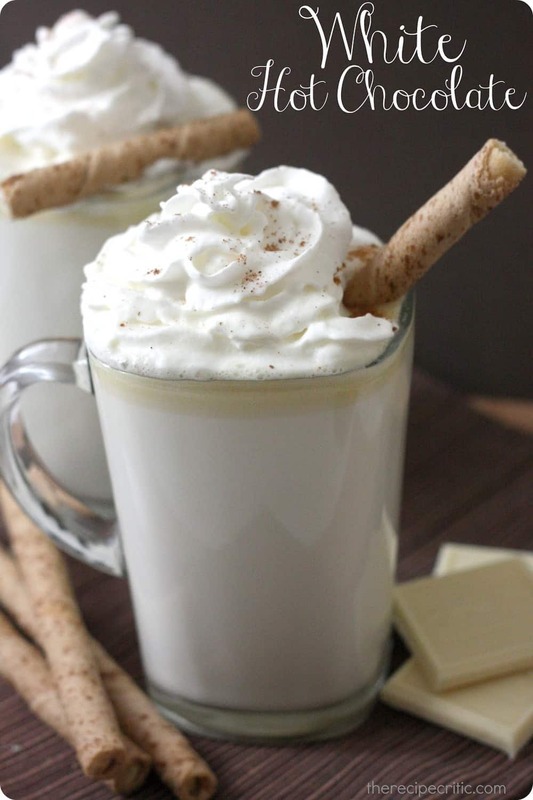 I was so excited to try this recipe for homemade white hot chocolate. It has been freezing in Utah and we just got a huge snow storm! This sure did hit the spot perfectly. I thought it was the most delicious hot chocolate that I have ever tried! It was amazing!! Things that I changed: I added a 1/2 cup of heavy cream for good measure! I also added a pinch of nutmeg to it! 1. Stir together milk, chocolate and vanilla in small saucepan. 3. Remove from heat and serve immediately, topped with whipped cream or marshmallows if desired. I love milk and dark chocolate best, but this looks so warm and tasty! Yummy!!! I LOVE white chocolate!!! You could also add some peppermint to make it white peppermint hot chocolate!!! Can’t wait to try this!! I typically don’t like white chocolate, but love it in hot drinks, so I will definitely have to try this. I never thought of adding peppermint, but was thinking of adding caramel sundae sauce to make white chocolate caramel hot chocolate. Mmm! Looks great! I am a big white chocolate fan! Yummy! I’d love for you to link this up to my Pin Me Party. Oh, wow, that looks and sounds delish! That looks great!! Already following GFC and glad to be following your PInterest as well. Used this recipe with the microwave though. Delicious! Oh my goodness this looks amazing! I could use a tall glass of this right now 🙂 Pinned! This looks so good! Nothing better than a little white chocolate… my favorite! Have a nice weekend! Looks delish! All of your recipes sound so good! Pinning this for later! I don’t drink hot chocolate unless it’s white. I substitute half & half for most of the milk, then add 1/2 cup of 2%, a splash of vanilla with white chocolate shavings, whirl it all in a heated mixer that froths as it dispenses. Cinnamon or nutmeg sprinkled as a topper. Mmmm. Do you think this could be done with soy milk? I’ve never tried heating soy milk up to drink and not sure if it is ok to do. My daughter has a milk intolerance that she is beginning to outgrow but just want to see if it would be an option to use the soy milk and it still turn out good or if there is something else that could be substituted. Thank you! This looks SO good can’t wait to try it!!!!!! ?